Socialite and Philanthropist Nancy Gan Wan Geok was found dead at her residence in Victoria Park Road bungalow in Bukit Timah between 7.30am and 8.46am on Wednesday, March 19, 2014. This topic is now trending in Singapore as well as in Indonesia and now gaining hits around the world. 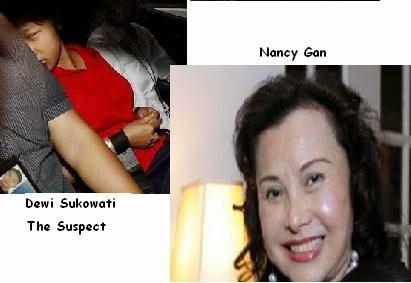 The alleged murderer or the suspect who killed Nancy Gan was her own maid, who was identified as Dewi Sukowati. Here's a short biography of Dewi Sukowati. She's 23 year old and now being charged of Murder, she is an Indonesian. Nancy Gan was 69 year old and she has two chlildren, she is the ex- wife of former Hong Kong Legislative Council politician Hilton Cheong-leen.